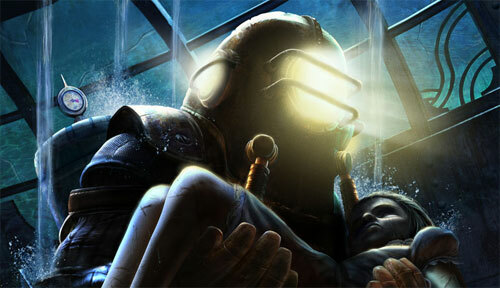 Besides Mass Effect 2 and Final Fantasy 13, Bioshock 2 was the third game that I was most looking forward to this year. I’ve said before that Bioshock the first was my favourite game on the Xbox 360 and it pretty much still stands today. So I was quite excited for the sequel. The game takes place years after the first within the same world; the dystopian underwater city of Rapture. However, you explore new and different parts of the city. This time around you play as a Big Daddy named Subject Delta; the big hulking robotic menaces that you had to fight in the first game. The Big Daddy’s are eternally linked to small zombie-like girls that wander around the city called Little Sisters. The Daddy’s sole mission is to protect the Sisters from harm. The game begins by showing how Delta was initially separated from his Little Sister, a girl named Eleanor. Delta is forced beyond his control to kill himself but is revived several years later as the Little Sisters repair him under Eleanor’s command. The rest of the game follow’s Delta as he destroys this maniacal family who lurks in the world of Rapture, but ultimately, to reunite with his Little Sister, Eleanor. For everything that Mass Effect 2 did to improve upon its predecessor, Bioshock 2 did not. Rather than going through a complete overhaul of the gameplay system like in ME2, BS2 took the more conservative approach and gave you more of what you loved in the first game. The gameplay and settings are virtually the same as in the first. They throw in a few new weapons and a few new abilities, but they’re nothing that will blow you away. The look and feel of the game is virtually the same as the first. You have some new locations, but generally, they’re still dark, dimly lit, leaky chambers. Because of all this, the game feels more like an expansion rather than a full on sequel. All the mechanics are the same as in the first game. You save Little Sisters which will award you ADAM Points that you spend on to purchase upgrades or new abilities. One new aspect they’ve added is the mode where sisters extract ADAM from corpses. When you locate the correct corpse and enable this mode, the sister will take a needle and extract ADAM indicated by a progress bar on screen. Until the bar fills up completely, your duty is to defend the sister from the attacks of multiple bad guys who have been lured by this activity. It’s a pretty intense and exhilarating 2 minutes each time when you have to do this. Much like the first game, you’re still collecting money from corpses and containers used to purchase usable items and ammo. You will be hacking vending machines and different robots like the first game, but this time, instead of a Pipe-Dream-type game, they simplify the process with a quicker mini-game. It’s one of those reflex/timing games where you have to stop a quick-moving needle in small areas of a gauge. I think I was one of the few people that liked the Pipe Dream mini game of the first, so I was sort of disappointed that they replaced it with this. It just isn’t as fun. Pipe Dream to me was a welcomed escape from the intensity that builds during the course of the game. The story also isn’t as good as in the first game. I never felt captivated by any of what was going on. There was a point where I just shut out the narrative and was moving point A to point B. It sounds trivial, but I think one of the things that hurt it was the voicework. By themselves, the voicework was fine, but you had a few female characters, who you’d only hear by voice communication and never see where their voices were so similar that it was difficult to distinguish who you were hearing. It needed more variance I think. So while the overall story wasn’t as interesting as the first, I thought that the ending sequence was still an emotional one all things considered. Overall, no, it was not as great as the first game, but it’s still a good game and warrants a playthrough. If you loved the first game, Bioshock 2 does well in giving more of the same gameplay that you love and seeing more of Rapture too. Until next time, later geeks!